The next task in 31 Days to Build a Better Blog, is anaylzing a blog in your niche. My niche, is pet blogging. So I picked one of my absolute favorite blogs, The Conscious Cat, written by my good friend Ingrid King. 1. Identify a successful blog in your niche. What topics are they covering? 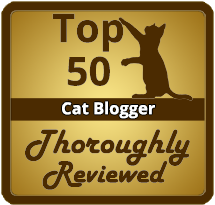 Ingrid covers reviews of cat toys, a weekly post with fun/intriguing stories (such as Mews and Nips from around the Internet), product reviews,book reviews, giveaways, rescues, fundraising for those rescues, cat celebration days, etc). What topics are they ignoring? Ingrid covers a vast selection of topics, particularly from a medical viewpoint, as she had been a veterinary hospital manager. If I could suggest an article to Ingrid, because I don't think she ignores anything, I would suggest an article on how The Conscious Cat post on "Tortitude" (found here) has over 6,898 comments - at 9/22/11 12:23pm - and is still counting! What voice/style do they post in? Ingrid mainly posts in her voice, though she opts to do two columns from her cats Ruby and Allegra's point of views. Ruby's reflections tend to entertain readers with cat toy reviews, as well as Ruby's crazy kitten adventures with breaking things here. Allegra, Ingrid's other kitty, posts to her column, Allegra's World. How often are they posting? Ingrid posts sporadically (don't we all? ), but posts 1-3 times a week, if not more. What level are they pitching their posts at (beginners, advanced etc) Ingrid posts not only for beginners, but also posts for cat-pros. Although, the cat-pros sometimes have a thing or two to learn. What topics generate most conversation? It is inarguable that the "Tortitude" post has generated the most feedback. However, whenever Ingrid is having a giveaway, there are many comments of hopeful humans/felines! What styles of posts seem to connect with readers best? Readers seem to respond best with personal accounts, such as Ruby's knocking glassware off the counter, or being a "vertical pee-er." What questions are readers asking in comments? Readers often ask for cat advice from Ingrid, which she takes time to thoughtfully answer each and every person who comments. I've certainly taken advice from Ingrid numerous times. Such as switching our cats to the cat food Weruva, which we are in the process of doing. What complaints do you see readers making in comments? I have not seen any reader complaints. What tools/mediums is the site using (eg: are they using Twitter, forums etc) Ingrid's blog is done through Wordpress, she is on Facebook, and Twitter. What first impression does their design give? Ingrid's blog design is visually appealing. What have they done well? What have they done poorly? 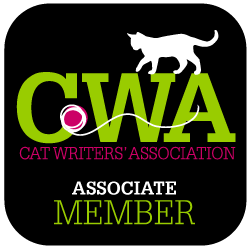 The eye catching banner with Ingrid's past cat Amber and current cats Ruby and Allegra are the first sight eyes will stumple upon entering her blog. What Options do they give readers to subscribe? You can follow The Conscious Cat by email as well as the CC Facebook page. what advertisers are targeting this blog? Cat related items ranging from - herbal essences, cat furniture, as well as many other feline toys, treats, food, etc. what type of affiliate programs are they promoting? 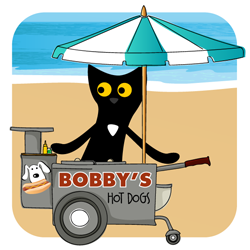 Ingrid also uses her blog to promote her book, Buckley's Story, her monthly newsletter 'News for You and Your Pet', as well as featuring links to adoptable pets in the local area. I visited the Compete website and entered Ingrid's blog. I saw stats for visitors to The Conscious Cat. The chart above shows visitors. 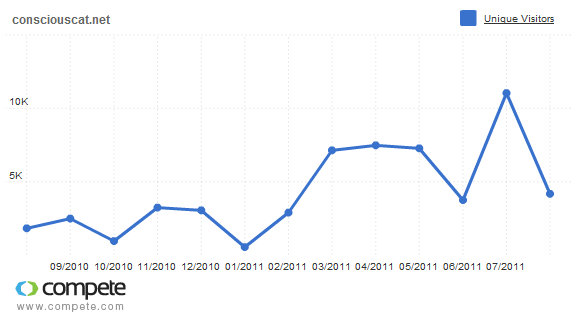 It is self interpreting to look at the graph and see the rise of visitors. I have no way of knowing if this is correct. Compete said the sample size for this site is small - psh, whatever that means. Check back on "The Situation," many exciting new posts coming soon! Ingrid King and The Conscious Cat, were not aware of this post until it was published. They have in no way compensated me for my review. This review is solely my own opinion and does not reflect the composition of The Conscious Cat. Thanks Caren! We love Ingrid too, her blog is awesome.